When David Tayloe Jr., MD, began practicing pediatrics in 1977, he did not have formal training about childhood behavioral and mental health issues. But when he realized that many of his patients needed help in these areas, he found resources to supplement his knowledge and ways to apply what he learned. It’s essential, he says, for all pediatricians to learn more about diagnosing and treating these conditions. “Over 15 years ago, we incorporated a mental health professional into our practice,” he says. “She teaches us, and we take care of patients together. 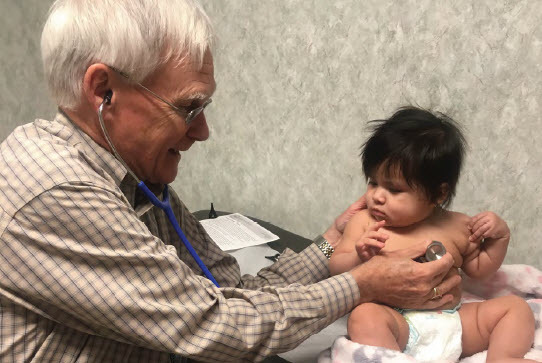 Then we recruited a clinical social worker, so we have two people now.” Dr. Tayloe founded Goldsboro (NC) Pediatrics soon after he completed his residency and still sees children there today. The practice also collaborates with a child psychiatrist, who conducts telemedicine interviews for children with serious mental illness, and partners with local schools so behavioral health services are available on site for at-risk students. In addition, Dr. Tayloe and his associates focus on prevention. They participate in the national Reach Out and Read early literacy program, screen mothers for postpartum depression, consider family risk based on the social determinants of health, weave parenting fundamentals into visits, and remind parents of the many helpful allies in the community, including schools, churches, nonprofits, behavioral health professionals, social workers, and care coordinators. Dr. Tayloe has served as President of the American Academy of Pediatrics and its North Carolina Chapter and currently teaches residents in the Department of Pediatrics at the University of North Carolina at Chapel Hill School of Medicine.